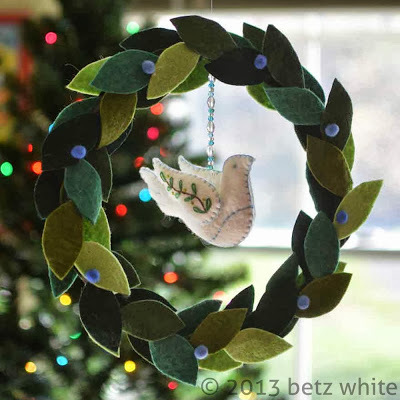 Members of the Holiday Stitch-along Ornament Club, get your Felt Peace Dove Ornaments made, because I have a cute little wreath you can make to go with it! If you’re not a club member, you can still join here, or purchase the dove ornament separately in my Craftsy and Etsy shops. Put dot of glue on the inside of the hoop near the top. Press the end of the brown strip into the glue then start wrapping the hoop at a 45 degree angle. Each wrap should be touching the one before. Continue adding dots of glue every few wraps. 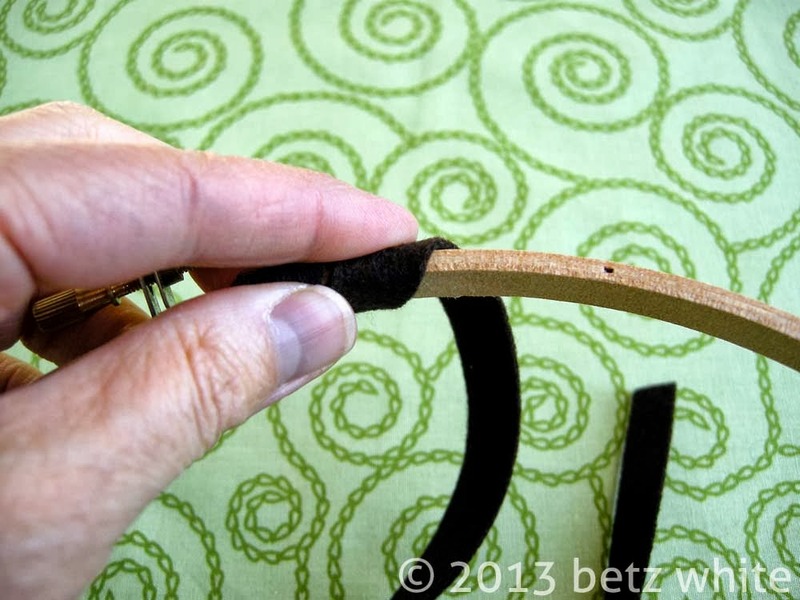 When you run out of strip, glue the end to the inside of the hoop and start with another strip right next to it. When the whole hoop is wrapped, start gluing the leaves onto the edge of the hoop. 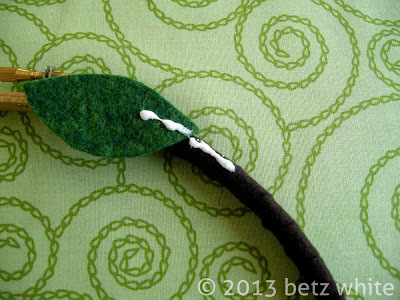 Continue, adding a small line of glue and pressing one leaf at a time into the glue, overlapping the leaves slightly. 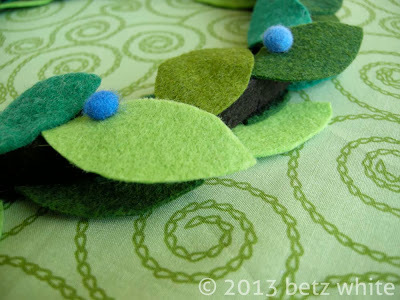 Once the first side is done, turn the wreath over and repeat, gluing leaves on the other edge. 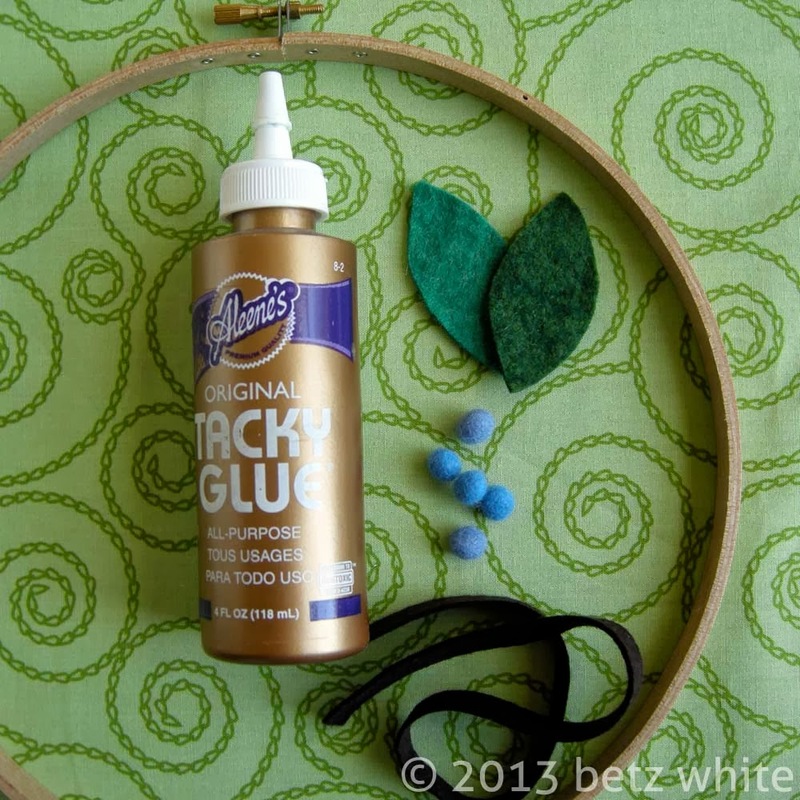 Next add the felt balls/beads with a dot of glue. Let everything dry well before the next step. 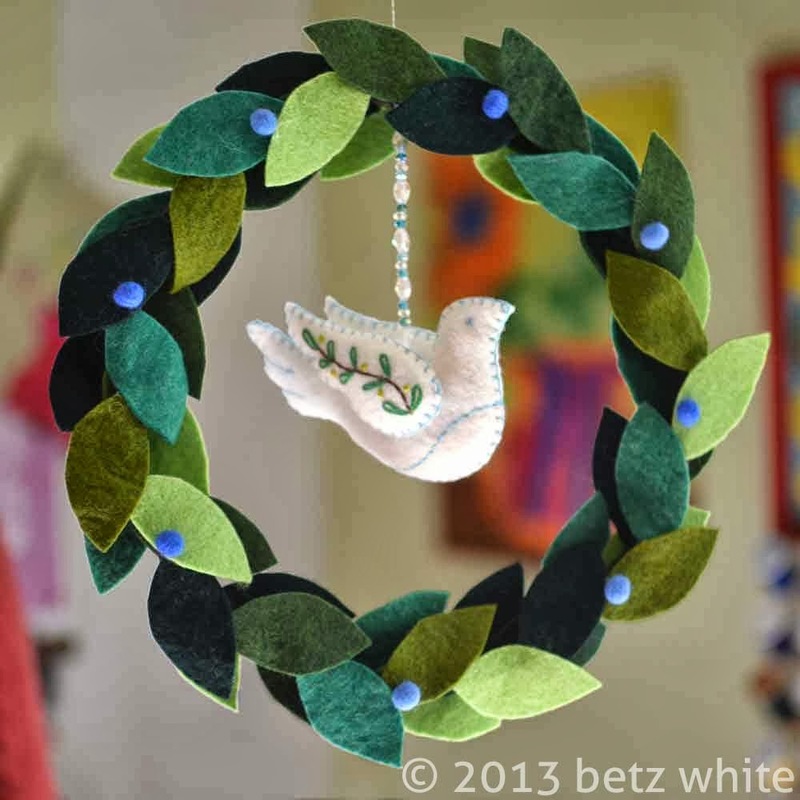 If you’re hanging your dove ornament (or any ornament for that matter) you’ll need to stitch the top loop of the hanger to the felt on the inside of the hoop. Find the top of the hoop (where the hardware is if you’ve used the outer hoop) then take a a few stitches through the felt wraps in the inside of the hoop to secure the ornament hanger. 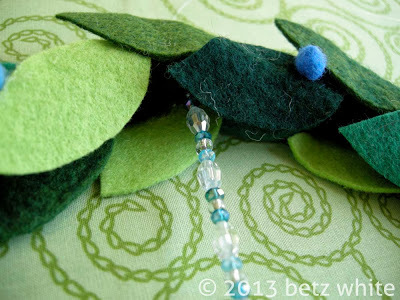 You’ll have to be careful not to stitch through your leaves in the process, but you should be able to just bend them out of the way. If you’ve used the inner hoop for your wreath, repeat this process at the top of the hoop to create a 6-8″ hanger for the wreath. If you’re using the outer hoop, you can string the line through the loops of the hardware, after removing the screw. Ta dah! I think this will look so pretty hanging in a doorway or a bay window. The dove and the wreath turn independently with a nice gentle movement (which makes it really hard to photograph, by the way). There are so many variations you can make with this idea! And since this wreath only uses one hoop of the pair, you can make two: one to give and one to keep. Remember, if you would like to make the dove for this wreath and haven’t joined the Holiday Stitch-along Ornament Club yet, you can do so now! The next ornament reveal is coming October 7th and I think you are going to love it! No, sorry no template this time. The leaf is a simple “eye” shape. If you draw half an eye shape on a folded piece of paper it will be symmetrical when you cut it out. Mine are 2″ long and 1″ wide.